Why is the journey called "Great"? 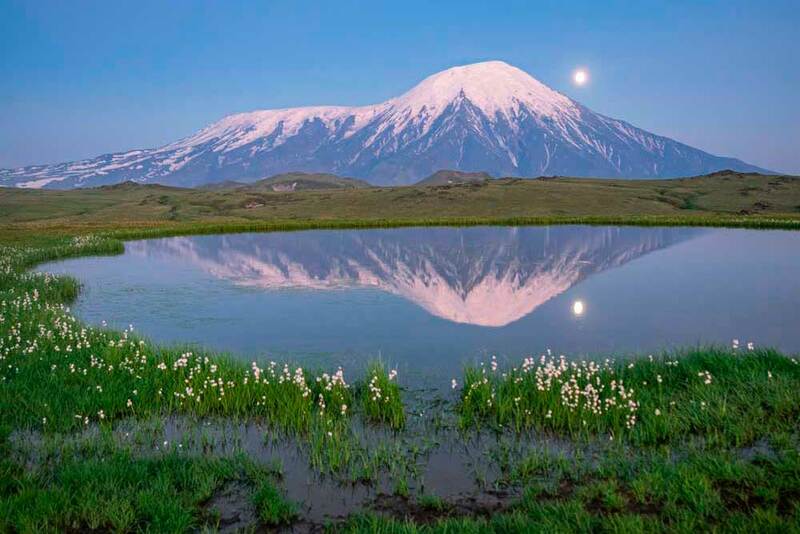 Because all standard hiking tours are limited to visiting the so-called home volcanoes - Gorely and Mutnovsky, as well as the Avachinskaya hill, which are located next to Petropavlovsk-Kamchatsky. 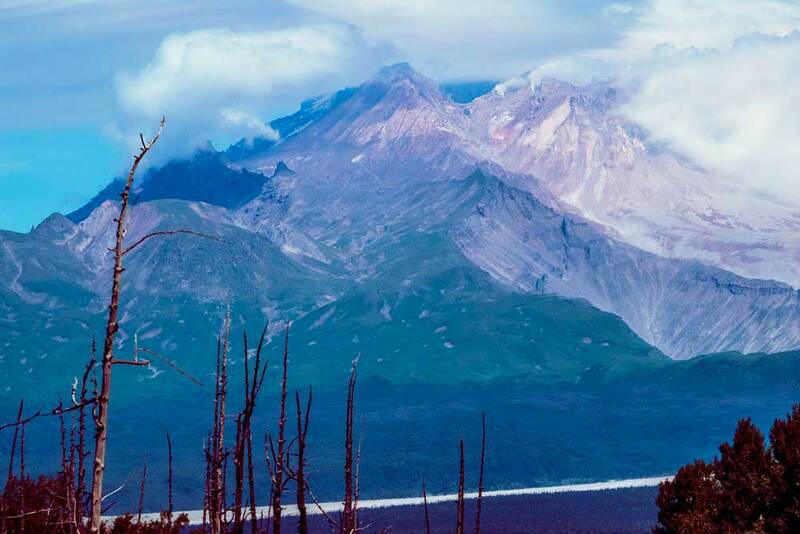 But we will go further - to the protected areas of Kamchatka and, having accomplished a rather complex track along the wild but incredibly beautiful terrain of the Tolbachinsky Dol, we will visit the volcanoes - Plosky Tolbachik and Klyuchevskaya Sopka - far and most interesting on Kamchatka. The latter, by the way, is the highest stratovolcano on the Eurasian continent, which can erupt at any moment clouds of smoke and lava flows. And around these two giants, a whole scattering of volcanoes is less, many of which are also active. This is much steeper and more interesting than home volcanoes! In addition, we are waiting for there are real alien landscapes, including even the names of extraterrestrials - the cones Mars and Jupiter, the crater Zvezda, the waterfall Phobos ... In the Soviet years there was even a base for testing lunar an Mars rovers. We will see here the Dead Forest - a mysterious, eerie sight, caves and many more such that you can not see anywhere else in the world! And on the way back we will relax in the thermal springs of the Nalychevo Nature Park near Petropavlovsk-Kamchatsky, "take a run" to the home of Avacha Hill volcano, swim and maybe even sunbathe (if the severe Kamchatka weather permits) on the black sands of Kamchatka - the famous Khalaktyrsky beach. Arrival to Petropavlovsk-Kamchatsky. Transfer to the city, we stay in the hotel, get acquainted with the city, try the famous Kamchatka delicacies - red fish, caviar, crabs. All this costs very cheaply here. Early rise, at 8 am we are already taking the bus and driving through the whole of Kamchatka to Lazo village. The road takes about 8 hours, and some of it passes not along the asphalt, so that the day will not be easy. But partially compensate for the difficulty of the magnificent views from the window to the virgin nature and volcanoes, many of which we will see along the way. Upon arrival, immediately sit down on the offroad car waiting for us and drive another 2-3 hours to the mystical Dead Forest, next to which we camp in an improvised camping and celebrate the beginning of the journey with a delicious dinner and travel stories. In the morning, after breakfast, we explore the Dead Forest - covered with volcanic ash and representing a creepy, but very interesting sight. Then we go in the direction of the volcano Plosky Tolbachik, exploring along the road various interesting places - "helicopter tail", "king-bomb", caves and impressive lava fields. We dine on the cordon of the reserve, and spend the night among the alpine meadows, setting up camp near the volcano - the purpose of our today's journey. Ascent to the Plosky Tolbachik volcano. 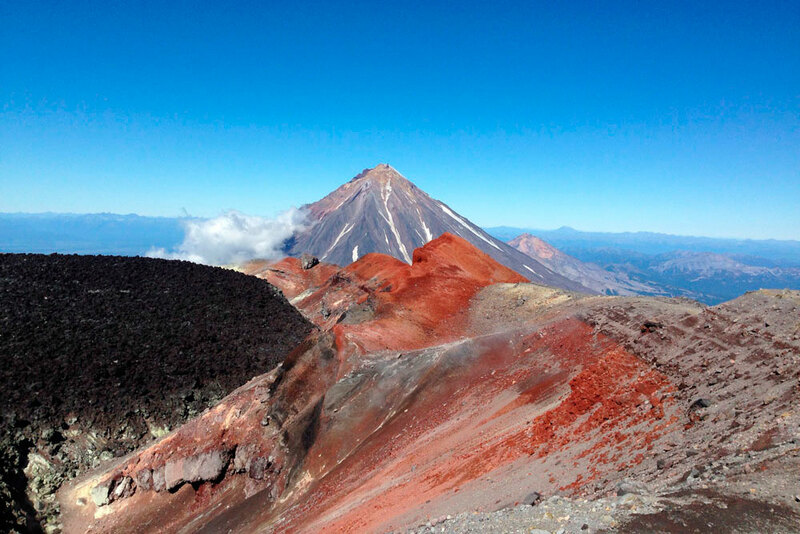 The volcano is active, the last major eruption on it was in 2012-13, its height is 3140 meters above sea level. The crater of the volcano is quite large - about 2 km in diameter and depth of up to 500 m, with walls breaking off inside. 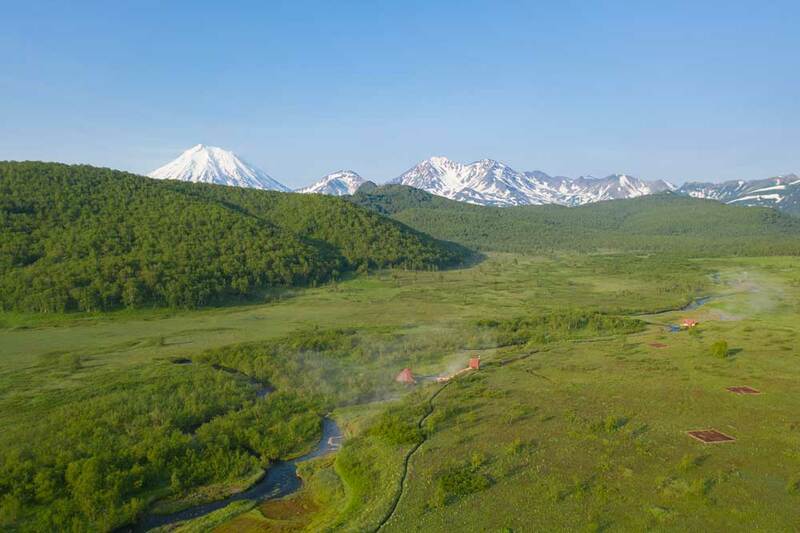 With good weather, panoramas are opened on the volcanoes of the Klyuchevskaya group and on the lifeless spaces of the Tolbachik valley with numerous cones and lava flows. Climbing back and forth takes about 8 hours, but, believe me, it's worth it - it's just space! After all, the eruption continues in the crater of the volcano, molten lava is boiling, from time to time throwing volcanic bombs into the air (do not worry if there is not an exacerbation of volcanic activity, it is not dangerous). We have breakfast, we are gathering camp and are moving in the direction of Klyuchevskaya hill. However, today we will not get to it, but we will limit ourselves to a modest 17-18 km by the standards of our campaign, having camped in the vicinity of several interesting sights - the cones of Mars and Jupiter, the cliff of Polenica, which got its name because of the similarity with the woodpile firewood - the rock is, as it were, composed of separate basalt pillars. We camp, relax and enjoy the views of these natural wonders. 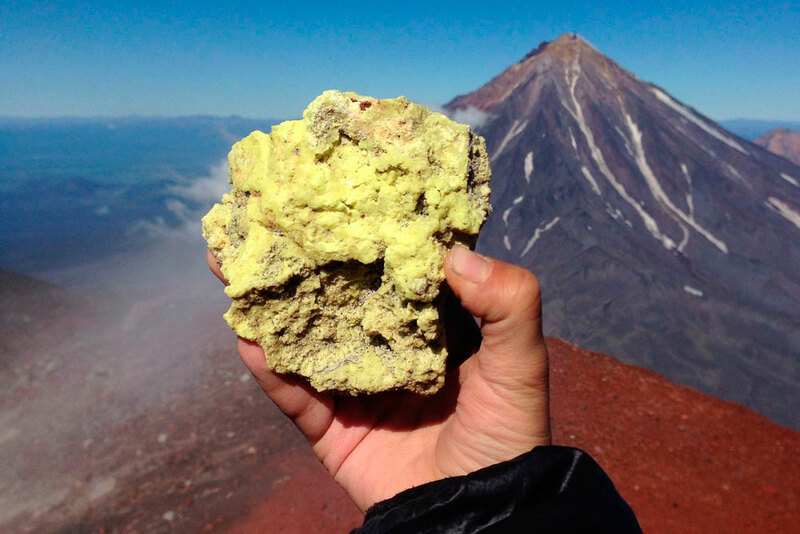 If the forces and time remain, and the weather will also be favorable, you can make an easy radial exit lightly to the edge of the crater of the active volcano Bezymyannyy, from which you can see beautiful views of all volcanoes of the Klyuchevskaya group. We overcome a fairly large area of a stone desert with numerous cones and lava flows, which even an experienced explorer does not to call easy and enter an even more complicated path - into the realm of winds, snows and eternal ice. In the vicinity of Klyuchevskaya Sopka there is a rather high plateau - 2600 meters above sea level and the landscape at this altitude is almost arctic, and in bad weather, even apocalyptic, but that's memorable for life - guaranteed! 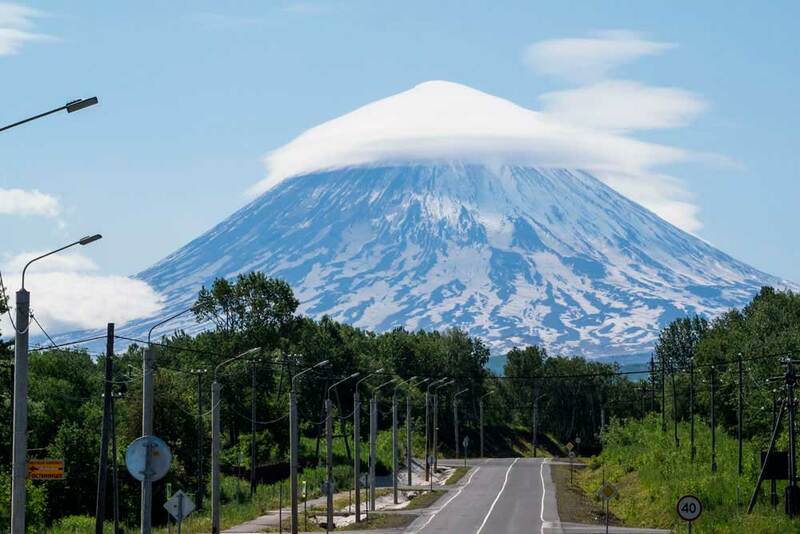 We will approach the maximum possible distance to Klyuchevskaya Sopka (4835 m.) - the highest active volcano of Eurasia and the highest high peak of Russia outside of the Caucasus, we will not climb on it - just enjoy its fantastic view, and then leave on - in the area of ? ?the extinct volcano Middle Sopka, where we will put the camp in a lifeless desert area next to the glacier, which will be for us a source of water. The night will be one of the coldest in this journey, but if we are lucky, we will see an incomparable spectacle - the eruption of Klyuchevskaya Hills (which occurs almost constantly with a greater or lesser intensity), accompanied by ejections of hot lava, which is particularly beautiful and spectacular at night. 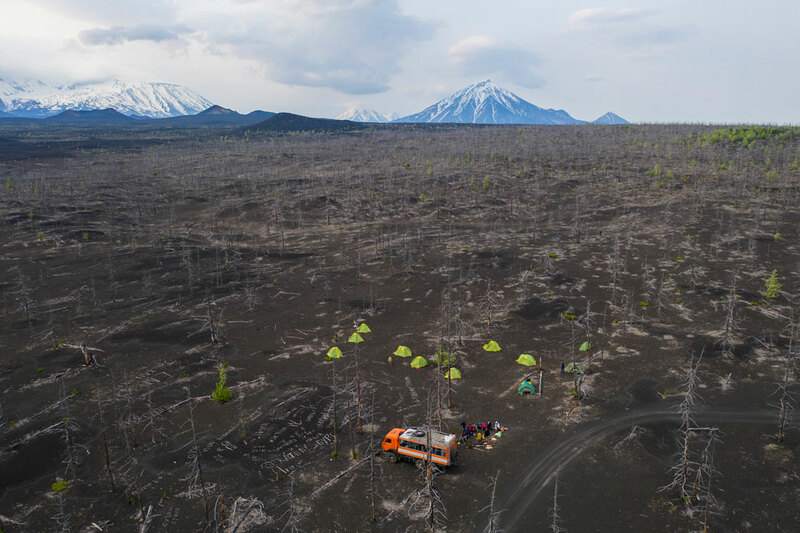 After half a day on a lifeless Arctic desert, in the afternoon we will come to the edge of the plateau, from which the descent will begin - to the forest zone, to the village of Klyuchi and with a fantastic view of the active and very active Sheveluch volcano in recent years. When we reach the forest, we will split the camp and enjoy the warmth of the evening bonfire, the dinner cooked on it and the feeling that all the most difficult is over! 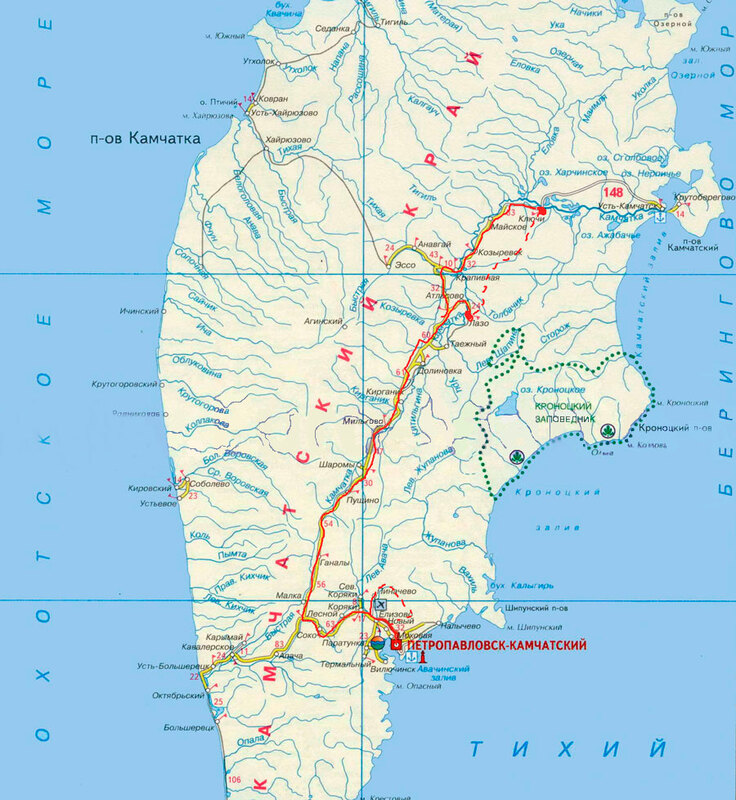 For half a day we reach the village of Klyuchi, from where a regular bus service to Petropavlovsk-Kamchatsky runs once a day. We will not find the bus that day, but we can take a shower in the hotel and finally eat "normal" food from the store or in the cafe, if it will work. If there is a desire and it will be possible to negotiate with local fishermen, from the Keys one can make a small excursion on a motor boat along the Kamchatka River - from it the volcanoes seem to rise to a record height by stone colossi. The river, skirting them and changing the direction of the current from the north to the east - to the ocean, provides an opportunity for a long time to admire them almost from all sides. In the morning we take the bus and go all day to Petropavlovsk-Kamchatsky. 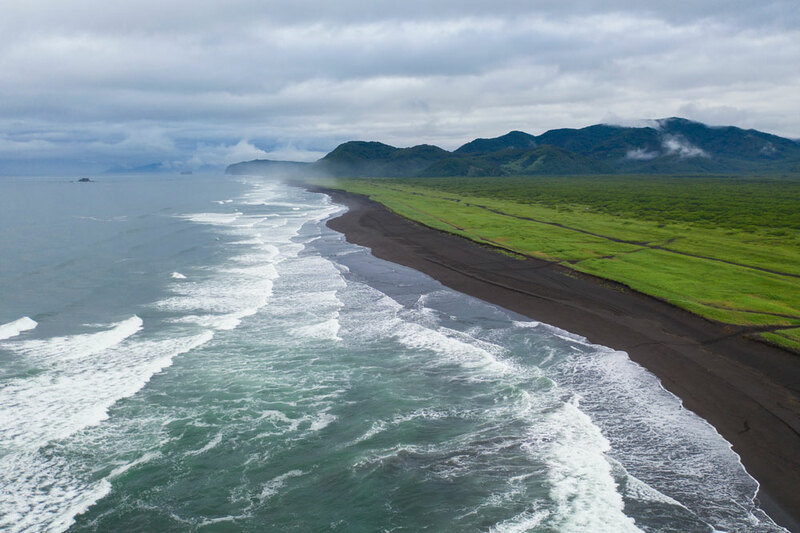 We spend the night, putting the camp on the bank of the great (it is this definition that first comes to mind in this place) of the Pacific Ocean, on the Halaktyrsky beach with black volcanic sand. 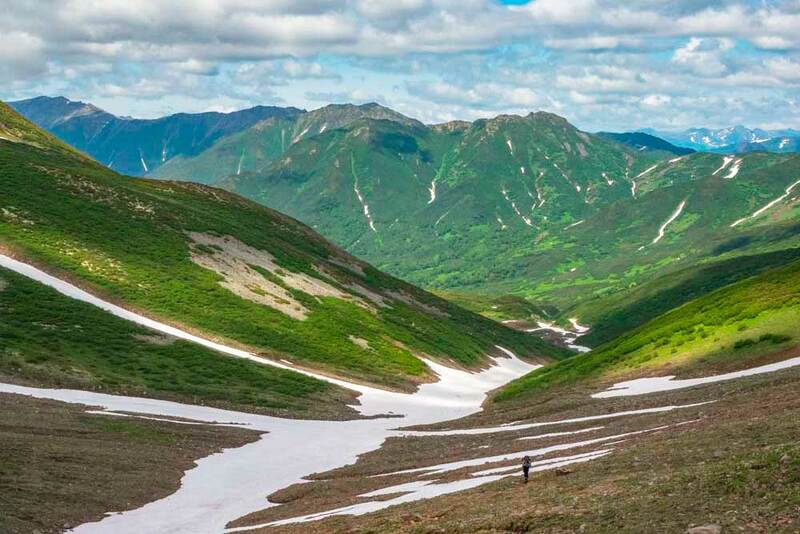 On this day, we will overcome the uncomplicated Pinachevsky pass and, after a total of 20 km along a good trail, find ourselves on the central cordon of the National Park, where we will spend the night comfortably. First we lighten the light to hot springs, and then continue our movement along the natural park trail to Aagsky, and then to Koryak Narzan - natural attractions "Nalychevo". The word "narzany" in the names indicates the usefulness of the water in them, which you can (and even need!) To drink. Near the latter we will spend the night with a beautiful view, as always. 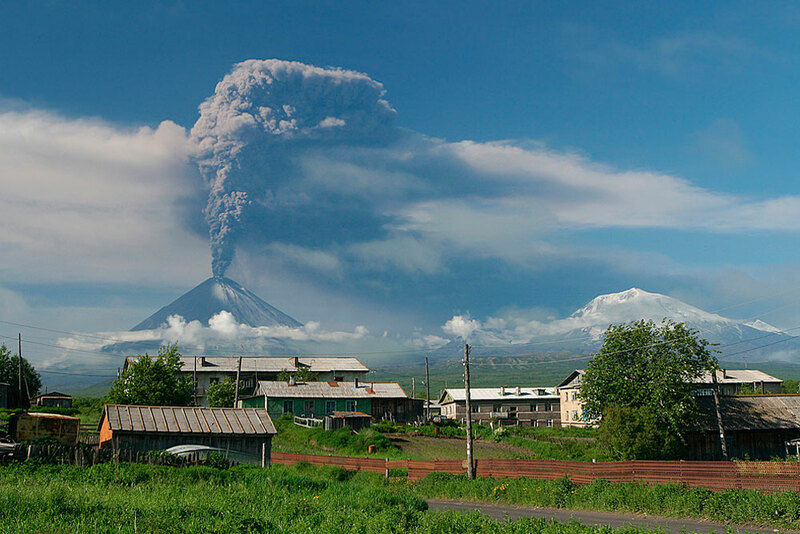 This time - against the background of the volcanoes Aag, Arik and Koryakskaya hill. This day will again not be simple, but it is for those who have not experienced all that by this time we will experience in a campaign against Tolbachik and Klyuchevskaya. For us there will be quite a usual load and become already habitual an alien landscape. 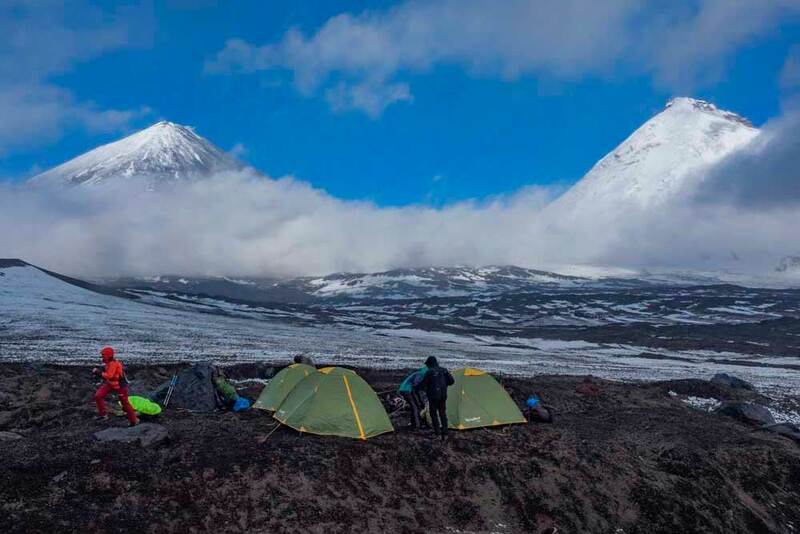 On the stone deserts, lava fields and snowfields, we pass the rather steep Avacha Pass to the foot of the Avachinsky Volcano, where we will set up a camp. Again we are waiting for a cold night, but we are not used to retreat? Moreover, the end of our difficulties is already very close. 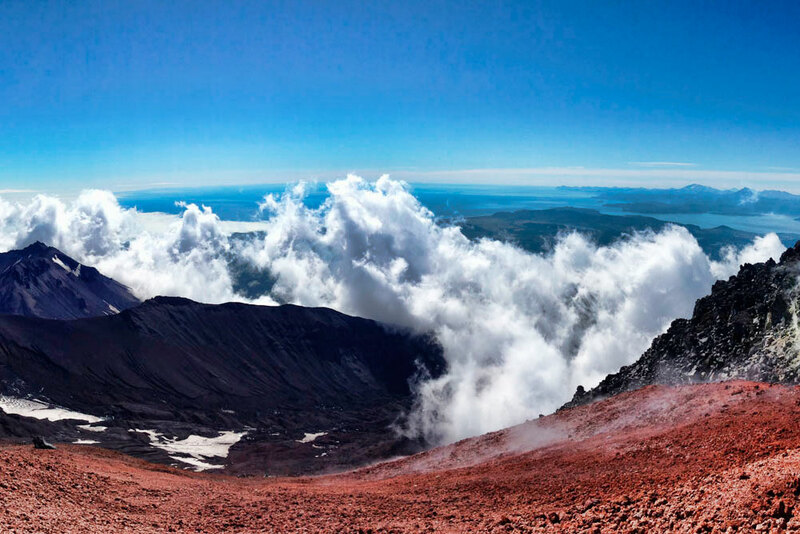 Climbing the Avachinsky volcano. It is not as high as Plosky Tolbachik and, especially, Klyuchevskoy - "only" 2750 meters, but on the summit, near the edge of the almost cratered crater, we are again and again - once already in Kamchatka - there are waves of excitement and pride for what we saw, we did it! Exciting panoramas of the natural park of Nalychevo and the Pacific Ocean are attached! After descending from the top of the volcano, we make a small crossing, take a bus and go to Petropavlovsk-Kamchatsky, where we settle in the hotel, enjoy the shower, and then go to buy souvenirs - red fish, crabs, red caviar, magnets or T-shirts with images of Kamchatka - everyone will choose for himself what is closer to him and wants to leave a memory of this amazing trip. And still there will be photos! If you are not a photographer and are not sure that you will get shots that will surprise and amaze your acquaintances, your instructor - a professional photographer - will provide you with such shots upon arrival as with you, and without you - the kinds of all places that we will visit - in large quantities and completely free of charge, this is included in the tour price! A spare day in case of delays in the campaign due to weather or transport. If we do not use it, then we'll just walk around Petropavlovsk-Kamchatsky, and for those who wish we can organize a sea excursion to whales, seals and bird colonies. Departure home. Farewell, Kamchatka! We will come back next year to see everything that we did not have time to see in this. other expenses not indicated in the section "The price includes"
This is a tour of high difficulty complexity. He needs serious physical and moral training, good personal outfit and equipment, it is very desirable to experience mountain hikes or sports category hikes. In a day we will pass from 17 to 25 km. with backpacks, whose weight for men is 20-25 kg, for women - 15-18 kg. Almost all the overnight stays in tents, often in the rain and strong wind. If living in a tent for a long time is a problem for you, if a 10 kg backpack is too heavy for you, if you do not like physical activities and are not ready to tolerate a lack of comfort, you better give up this trip. However, if you are not pampered, profess an active way of life and are ready for testing, even in the absence of field experience you are quite capable of this trip, you only need to pre-tighten your physical condition - tell us about your desire and we will prepare you a program of individual training! 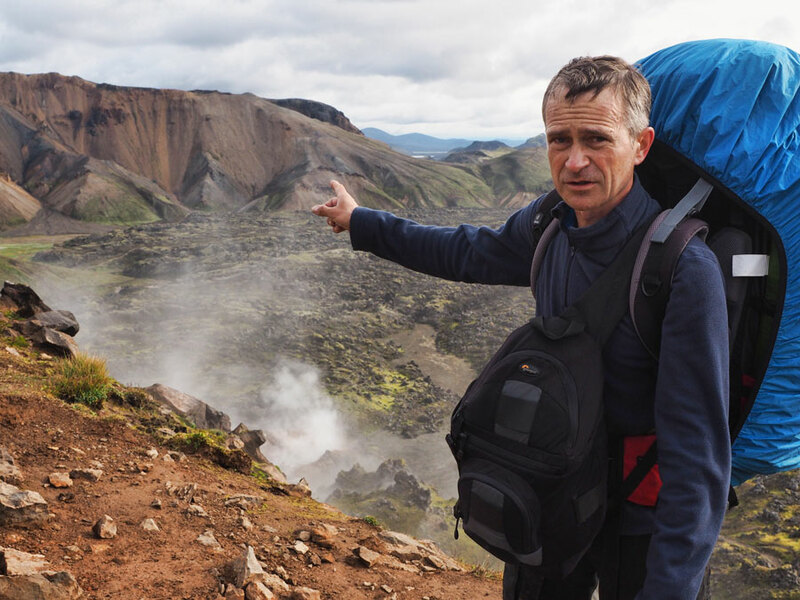 For this tour it is necessary to take a sufficient supply of warm and waterproof camp clothing - a light down, as well as a membrane jacket, waterproof trousers, trekking shoes, a set of thermal underwear, as well as a hat, gloves, warm socks, fleece, sunscreen and sunglasses (for ascending the volcanoes). In addition, you will definitely need a backpack for 65 - 90 liters, a waterproof cover for it, a raincoat, a headlamp, a thermos, a mosquito net, a warm sleeping bag (-10 degrees comfort), a good mat, rubber slippers of the Crox type for wading rivers and streams , as well as climbing cats. A full list will be provided to you by the instructor when concluding a tour contract. Also, the instructor will necessarily advise you that you do NOT need to take it, so as not to overweight. If you are interested in this tour, leave a request through the form below or call the indicated phones, me, Evgeni Androsov or my assistants will tell you in detail about the route and answer all your questions. To reserve a place, you must pay an advance payment of 30% of the cost of a hike / tour if it is more than 45 days before the start and 50% of the cost if before the start less than 45 days. The prepayment is refundable for 45 days or more before the start of the trekking tour and unfortunately, less than 45 days before the start of the tour / tour, if the refund is related to your refusal to participate (for any reason). If the hike / tour does not take place due to our fault, due to an unformed group or due to force majeure circumstances, prepayment will be guaranteed to you in any case. In the hike the group moves with the speed of the last participant, the participants are trained by the instructor to prepare the food and install the tents. The instructor reserves the right to refuse participation in any person if he sees that a person is physically or mentally not ready for a trip. On the route the instructor has the right to interrupt the movement of the group and to stop the trip in case of danger of further advancement, as well as due to the state of health of one or several participants. These circumstances are for force majeure, there is no provision for money for the campaign and other financial compensation.